Hey guys. Picked up a new S&W 69 with the 2.75" barrel. First new smith I've bought and so far I'm pretty happy. Factory 44 specials are soft enough but tne full house 44 mags are kinda stout. Want to start reloading for it and am looking for some starting point suggestions. Want to stick with the 44 mag cases but load a little softer range round. I have AA9 and AA7 on hand but rarely see people use these for 44. Anything better for lighter loads or will those work fine? How bout bullets? Stick with 240 gr or go with something lighter? Just looking for some ideas to start experimemting with. When I first started loading 44 mag I made the mistake of loading full power loads. Still have a bunch of those left. Good for shooting in the lever action but not that much for handgun. Found that you can use 44 special loads using mag brass and lead bullets. Pleasant and fun to shoot. I would have to check for exact recipes. YMMV. Use caution and do more research for yourself. I have a 44 Redhawk I reload for, haven’t shot it a bunch lately though. Most of my casual shooting loads are with H Universal powder, which is in the ballpark with Unique on burning speed. I have some plated bullets I load when just plinking and such, 200 grain I think. With most of the magnum handguns I have the full house loads around, but do most of my shooting with modest loads. You do need to do your own research, and testing. 240gr LSWC on top of 17.5gr 2400 works well in my S&W 329PD. I normally shot full power .44 Mag loads, but this year I'm working on some milder loads. Currently, I'm loading 240gr bullets with 10.0gr of Unique. OK thanks for the info so far. Just ordered the dies and conversion kit from dillon. I'll pick up some 240 gr fmj bullets just to start off with. I've never used lead or cast yet. Load for 357 sig and 40 s&w right now and usually work with rmr or extreme plated. Maybe pick up some plated 240s just to try out since I'm first gonna start out with some mild plinking rounds. I'll do some research and keep you posted when I finally start testing out some loads. In magnum brass, Unique works well as does Win 231, both of which will do nicely in about any handgun cartridge you'd care to reload. Skelton's old .44 Special load (7.5 gr of Unique behind any good LSWC) can be put up in magnum bass by using 8.0 gr of Unique or 7 grains of Win 231. Both will give 950 fps out of your M69...they do nicely in mine and will reward you with 2" or better groups at 25 yds. For commercial cast bullets, try Missouri Bullet Co.'s 200-240 gr TWC's and SWC's for superb accuracy. If you have trouble with minor leading, try swirl lubing them in Lee Liquid Alox diluted with about 25% mineral spirits. You can do 200 in 5 minuted this way and it overcomes the hard commercial lube which sometimes fails at low speeds. I like 0.430" dia. cast .44 bullets in my Rugers and Smiths. But I have used up to 0.432" with no problems. Politicians, Preachers, Educators, Journalists and Community Organizers are beneficiaries, not defenders of our freedoms. A search for "Brian Pearce 44 magnum loads" will also give you some interesting reading material as far as the velocities and pressures from target loads on up. 8-9gr of Unique under a 240-250gr LSWC, about the perfect 44mag snub load. I like 180-gr bullets over 26.5 gr H-110, but that's just me (lots of flash). Hodgdon says you can go as high as 31.5 gr H-110, so it's safe (they also recommend a starting load of 29.0 gr--use a magnum primer). 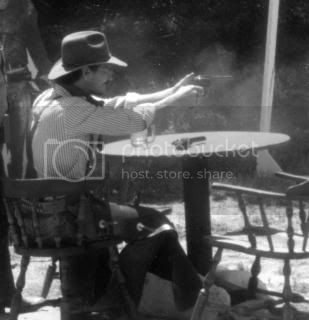 Thanks Jackimoe, for that tip on Brian Pearce's excellent piece on the .44 Magnum.